Report: Smart cars coming to U.S.
DaimlerChrysler expected to announce plans Tuesday to bring fuel-efficient sub-compact to U.S. market. NEW YORK (CNNMoney.com) -- DaimlerChrysler is set to bring the fuel-efficient subcompact Smart car brand to the United States in 2007, according to a published report. "We have not made any decision on a U.S. launch," said Bettina Singhartinger. "You can expect something this week. Until then we do not comment on speculation." 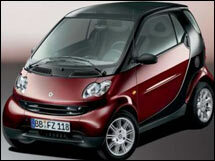 DaimlerChrysler has never made money on the Smart brand, which has been sold in Europe since 1998. The brand is part of DaimlerChrysler's Mercedes-Benz unit. The two-seater egg-shaped cars get 46.3 miles per gallon in the city to 70.6 mpg on the highway, according to some estimates, although Singhartinger points out that if the brand is brought to the United States, it will be the next generation of the vehicle which is due to be rolled out in Europe in early 2007. With U.S. gasoline prices near $3 a gallon, and lagging sales of the large SUV's and pickups that DaimlerChrysler's Chrysler unit depends upon, it would appear to be the right time to bring Smart cars to the U.S. market. But the U.S. market is also becoming flooded with fuel-efficient sub-compact cars right now, with the Toyota Yaris, the Honda Fit and the Nissan Versa all debuting in U.S. showrooms this year. Those models also have the advantage of having their U.S. dealer network in place. It's not clear if the Smart car would be sold in U.S. Mercedes dealerships, in Chrysler and Dodge dealers or a new dealer network. One reason for the profit problems for the Smart brand is a low selling price at that part of the market. The three Japanese sub-compacts coming to the market sell for between $11,850 and $14,000. Related: Is it smart to bring Smart to the U.S. market?